Shantytown residents view commmunity exhibit. The Social Photography Workshops (Talleres de Fotografia Social or TAFOS) was a singular organization. Just one look at the black and white photographs makes it clear that the grassroots photographers were something special. None of the original participants had ever held a camera before, and many were functionally illiterate. But their best work is like the earliest daguerreotypes: a world at first sight. This visual eloquence, as expressed among the peasant communities, is unique in other ways: it is a landscape vision, not a portrait vision as in the Western way of seeing the world. It encompasses the rivers, fields, plants, and animals -- all are equally important as the individual. Both share the same setting. From its beings in the mid-1980s through to it end in 1997, it provided a challenging vision of Peru. For a more comprehensive explanation of TAFOS's agenda, check out this presentation from 1989. For me, it was a remarkable experience. Tomás Muller, TAFOS founder, had the original inspiration to get the idea moving. Thanks to him, I was given access to the enthusiastic support team, the photographers and their communities. I spent nearly a week in a retreat with the Puno team in 1990. I have been lucky to have a broad selections of pictures to help illustrate this site. I helped them get published in Newsweek International and organized a couple of small exhibits in Washington in 1991. 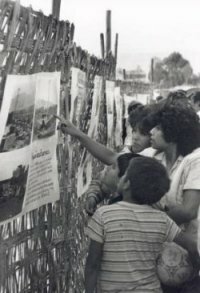 When I went back to Peru in 1994, I convinced the International Potato Center to bring out a calendar featuring TAFOS photographs. We also had an exhibit in the CIP gallery. Donation of TAFOS Archive to the Pontificia Universidad Católica del Perú's Science and Art of Communication Program, all black and white 150,000 negatives, in 1999. This is a historical motherlode that will be mined and refined for decades. Please click on the images to see a larger display of the photograph. On the high plateau of Puno in southern Peru, a marriage party proceeds with the bride and groom mounted on horses. Passing under the arch of flowers endows the couple with prosperity. Among the impoverished and marginalized, you can never underestimate the power of the word, either spoken or recorded. A meeting of a grassroots organization shows how the campesinos can capture modern technology to their own message. On rural Peru, the grindstone is synonymous with bread and strong hands, no matter how young. This one is in the northern Amazon foothills. When Peru was going through Sendero's high tide, it staged "armed strikes." It threatened to kill anyone who dared to go to work during the strike. Buses were burned. Drivers were tracked down and killed. The police and military were equally decided in keeping the buses running.